I was in a lecture recently where there were 50 pre-service teachers preparing to transition into the profession. We were talking about the three school systems as they operate in the different states and one student spoke up saying he was afraid to teach in Catholic high schools. He was under the impression that he would be reprimanded if he said ‘the wrong thing’ on public debates where the Church takes a strong position. There was a murmur of agreement in the room as others spoke up with similar impressions, some brought about by experiences on placement. Supervising teachers had made gestures from the back of the classroom trying to close down discussions which turned ‘controversial’. A church school comes alive when teachers and students breathe an air of freedom. If pre-service teachers believe Catholic schools are authoritarian regimes governed by fear, then there is a problem. Schools cannot ‘share the good news’ if teachers are afraid. Teachers are held back if they are afraid. Parents and students are formed in their society’s democratic citizenship, and as such they expect rigorous, free and open conversations in the classroom. Such conversations are a key part of a teacher’s great vocation to help students be at ease with themselves, think critically, listen to their conscience and walk the way to life. In Catholic schools, teachers can prepare students for responsible lives informed by faith. A spirit of inquiry and curiosity, and an ability to dialogue with views different to one’s own, should be basic dispositions for teachers. In the best classrooms, teachers can model considered discussions on all sorts of issues. When teachers ask helpful questions they can draw out the thinking of students so that they can engage with public debates at depth. Our students will then have their own questions as they uncover the principles at work in various publicly advocated positions, including those proposed by the Church. With the confidence to chair conversations, teachers can encourage students to think critically about public debates in an open, reflective, respectful, principled and evidence-based manner. The way teachers guide conversations in the classroom helps to either illuminate or cloud public debates for their students. As George Lakoff explains in Don’t Think Of An Elephant, debates can be won when the terms are set. A debate about ‘tax relief’, for instance, is founded on an implication that tax is more a burden than a social responsibility. Consider Australia’s recent debates about marriage. Students thinking about the proposal of ‘marriage equality’ often saw it as a logical extension of the ‘social justice’ frame the church proposes in its social teaching. In that case, teachers in Catholic schools could ask questions of students about which principles at work in Catholic social teaching they are drawing upon, breaking open ‘human dignity’, the ‘common good’ or ‘solidarity’ while also inviting students to consider church teaching on marriage in its own terms. In so doing students can consider the power and merit of the ‘equality’ strategic framing, deepen their appreciation of principles of church teaching, and see their initial position in a broad context. As Thomas Merton writes, following Voltaire, we are known better by our questions than by our answers. When there is only the ‘party line’ mentioned in such conversations, then that line is automatically delegitimised in the eyes of students and teachers alike who want to explore issues and their underlying principles. 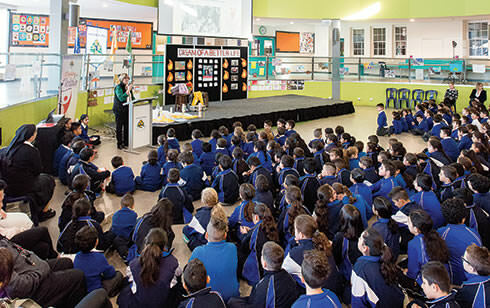 As prospective teachers may be under the impression that Catholic schools are governed by closed systems of command and control, then teacher formation needs to provide them with tools which will encourage critical thinking about public conversations. James O’Brien is in the final semester of a Masters of Teaching at ACU Melbourne. This article was first published in Eureka Street.